FortiesConnect.com is not like other mature dating websites. Billed as an exclusive online dating service for eligible 40 something singles, it has a young and fresh feel. The site has a clean design and the appealing graphics create an immersive experience right from the outset. It helps to make the online dating experience an enjoyable one all the way through. Whether you just want a fun romance or a more serious long term relationship, with over two million members, there’s a good chance you’ll find what you’re looking for. FortiesConnect.com is free to join. So if someone catches your eye, you can start connecting with them straight away. FortiesConnect.com is packed with features that you’ll find useful, and the clever design layout means it never gets overwhelming. It’s also mobile responsive so even date while on the go. Once signed up you’ll be directed to the home page dashboard. The first feature you’ll find is Encounters: three suggestions of people you might be interested to meet. If you select no, you’ll automatically be presented with new suggestions. So you can keep going until you find someone you fancy. Also on the dashboard is a section to show you who’s online right now, any new members today and recently updated photos. At the bottom scrolling photos show you whenever someone new comes online or if they add your profile. If you're into astronomy, you’ll appreciate your daily horoscope, which can be a useful way to help guide your dating decisions. When you find someone you’re interested in you can send them a message, a wink or add them to your favorites. You can even send free messages to anyone online. However, you will need the paid membership to read replies. 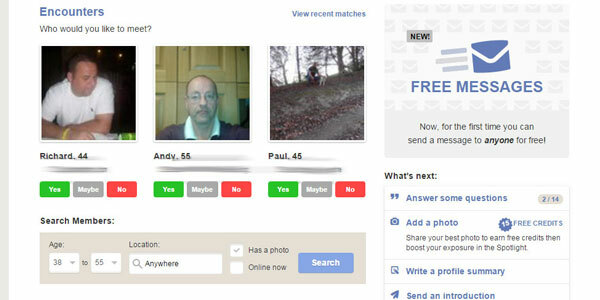 The paid option gives you many other additional features including The ability to upload a video profile to reveal more about your sparkling personality and see other members’ video profiles, see who’s viewed your profile, send and receive private messages, chat online with the instant messenger, create and read dating diaries. You only need to answer five easy preliminary questions in order to become a member of FortiesConnect.com including whether you’re a man looking for a woman or a woman looking for a man, your date of birth, first name, an email address and password. After this you can already start searching. However, in order to improve your chances of finding a match quicker, it is recommended that you complete your profile. There are five stages to set up your profile. The first is to upload a photo. Next you’ll be asked a series of questions such as: What do you like to do for fun? What is the most interesting fact about you? The third stage is to give some more details about you by describe yourself as well as what you are looking for. 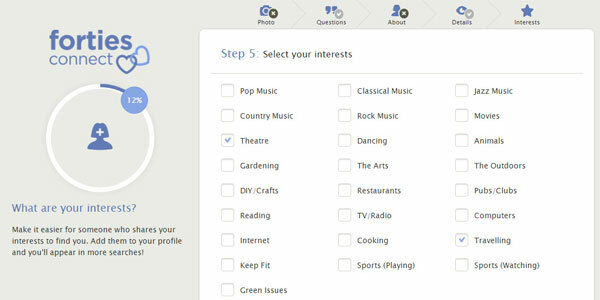 After this there’s a series of drop down menus to reveal more about you and your lifestyle. This covers everything from your occupation to marital status, your income, physical appearance, religion and ethnic origin and even whether you’re a vegetarian. You can choose how in depth you want to go and have the option to skip any parts you don’t want to fill out. The final stage is to select your interests. You can choose from options such as music, restaurants, the arts. They are all tick boxes so it’s quick to complete. There’s a clever feature here whereby whatever you tick on this page; it will update the number of other members who share the same interests. So you can see how many others you have something in common with. This is a carefully vetted site. Before any member can start dating, their profile is checked and they have to verify their account via email. FortiesConnect.com also provides helpful tips on how to date safely online as well as advice for when you’re ready to meet someone in person for the first time. The great thing about FortiesConnect.com is that you can check out many of the features with the free account. So when you're ready to sign up for the paid account, you know exactly what you are getting. There are various pricing options and you can sign up for as little as a month at a time at for $15.00. If you are happy to commit for a longer period, there are savings to be made on your membership. For a year $9.17 per month, a 3 or 6 month subscription, it works out to the equivalent of just $10.00 per month. The layout of the site is intuitive and easy to navigate. It’s very easy to learn and there are helpful tips all along the way. You’ll find most of the options you need on the navigation bar at the top. Most of these features are also repeated on the dashboard in a more graphical format. So you can use whichever option you prefer. The layout makes it more like a fun quest to find love, rather than tedious procedure. You'll find that you actually enjoy the process. There are two tiers to Forties Connect search. The free option lets you search by location, to find other singles in your area. While with the paid option you can use more advanced search options to find singles by interest, age, zip code, whether they have children or smoke. This Forties Connect review found that with the detailed descriptions you get a really well-rounded overview of other members. You’ll find it fascinating to read through their profiles. In addition, it enables you to make an informed decision choosing to sign up only once you've found someone (or even several people!) that you’re interested in. However, if you still don't find what you're looking for, read up on our review of OurTime.com, for a great alternative dating site for singles over 40.